Found in New Guinea in range forests at elevations around 1300 meters as a mini-miniature sized, cool growing epiphyte with conical-cylindrical, adpressed to the rhizome pseudobulbs carrying a single, apical, erect-patent, elliptic, acute leaf that blooms in the early summer on an erect, very short, single flowered inflorescence. Schlechter states that the flowers are yellow, the lateral sepals have red stripes on the inside and the lip is red brown with a paler center. 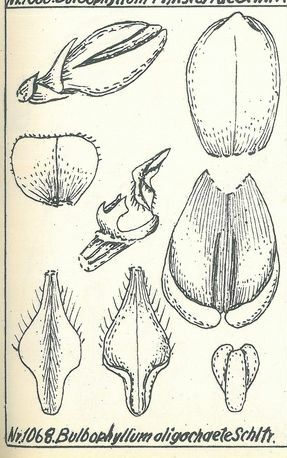 References W3 Tropicos, Kew Monocot list , IPNI ; *Orchidaceae of German New Guinea Schlechter 1913/85 drawing ?